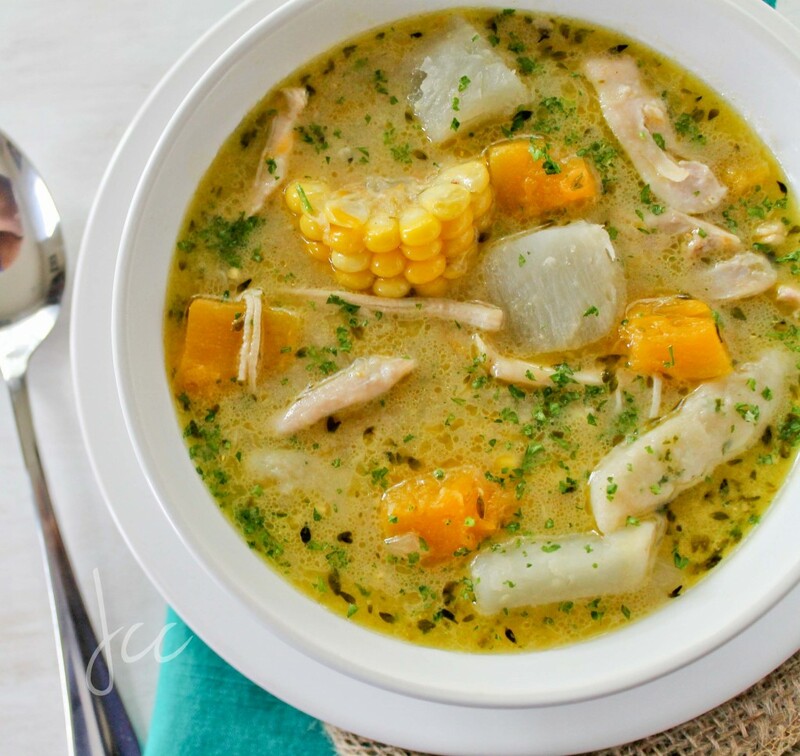 Most soups are considered cold weather fare yet in the Caribbean and Guyana where its hot year round soups are extremely popular and are typically served on the weekends. 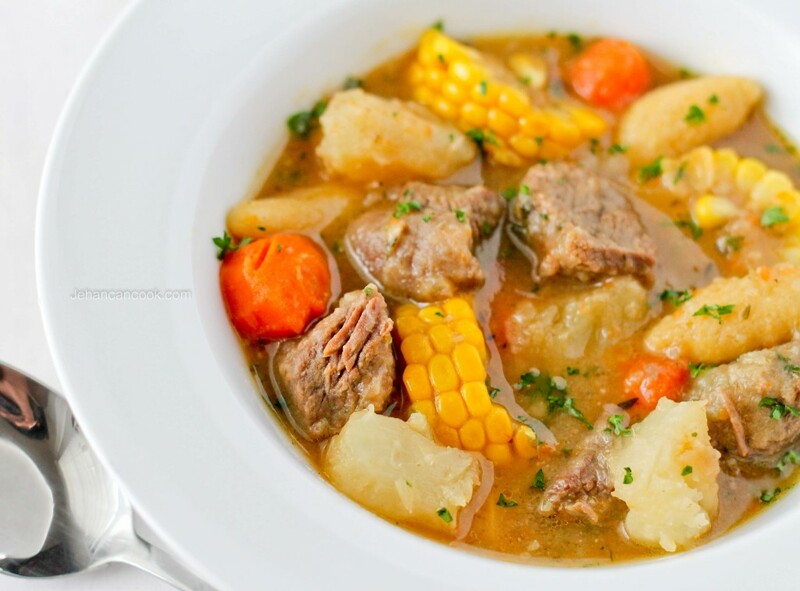 There are hearty soups that are made up of various meats, vegetables and ground provisions (root vegetables such as cassava, sweet potatoes and yellow yam). Then you have the lighter soups such are Fish Broth and Manish Water which typically have a thinner broth. Salted meats such as pig tails and unusual parts such as cow foot and chicken foot are often added along with the main meats to make it even more special. Dumpling or duff are also added to kick it up a notch. 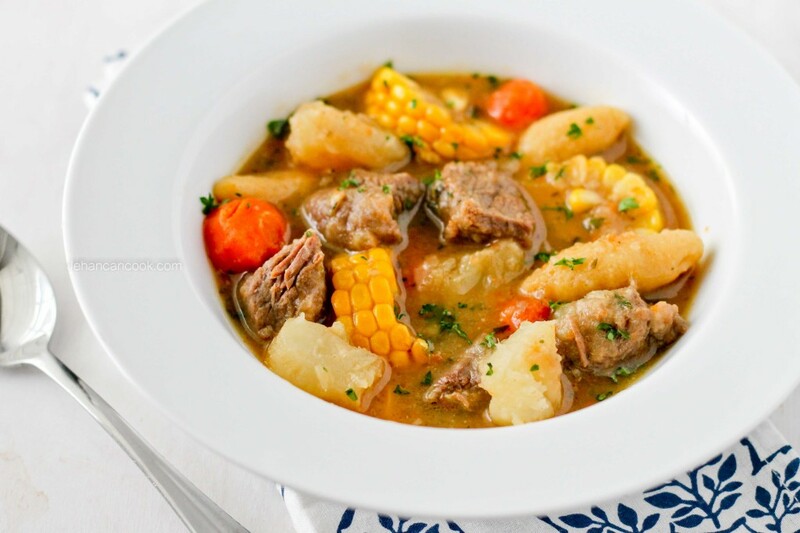 Whether it’s Red Peas Soup, Corn Soup, Cow Heel Soup or Sancocho, they are all highly revered and very much a treat. I love the simplicity of soups and the fact that it is a one-pot dish. If you follow me on Instagram, you will see that I’ve posted different varieties of soups. While I don’t stick to any particular combination of meats and vegetables, the formula is the same. Meat, vegetable, a starchy vegetable and dumplings are used to make this a complete meal. 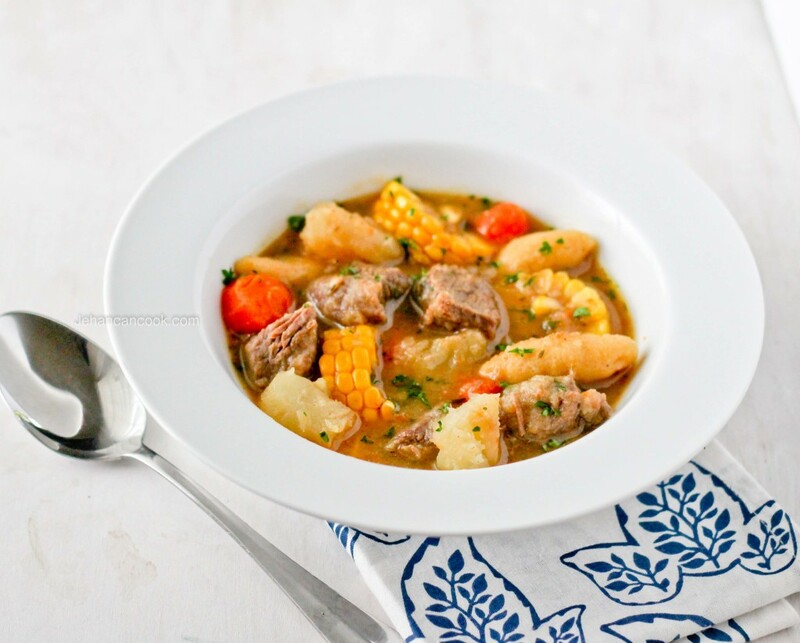 In this edition of Beef Soup, I used chuck steak, carrots, Caribbean sweet potatoes (boniato) and cornmeal dumplings. A broth that’s well seasoned with thyme, garlic and bay leaf rounds out this soup nicely. I love the versatility of soups; if you don’t fancy sweet potatoes, you can use regular potatoes or cassava. Pumpkin in place of the carrots is also an excellent substitute; you can add whatever combination you like. Cut beef into 1 inch pieces then season with salt and pepper. Place a large Dutch oven over medium heat then add canola oil. When oil is hot add beef and cook for approximately 10 minutes, making sure to brown the meat. Next add onions, carrots, garlic and thyme and cook for 5 minutes or until the onion has softened. Next add broth, water and bay leaf then bring to a boil. Lower the heat to a simmer then cover pot and cook for 1 hour 20 minutes or until the beef is tender. Next add sweet potatoes, corn, pepper and cook for 20 minutes or until the sweet potato is tender. Add dumplings and cook for an additional 15 minutes. Do not open the pot while the dumpling cooks. Remove from heat and add chopped parsley. Serve warm. To make the Cornmeal Dumplings: Place flour, cornmeal, salt and baking powder in a small bowl. Add milk and stir to combine. Let sit for 15 minutes then pinch of about 1 tablespoon of dough and roll into 2 inch long pieces. Set aside until ready to add to soup. thanks for these recipes very very much!!! A few okra added for extra fibre also tastes amazing.. It looks light and hearty at the same time #gorgeous! I grew up eating soup all year around. There is definitely an art and taste for lighter hearty soups using seasonal vegetables. I would like a recipe for Cow foot soup. Is it necessary to use Beef broth ,ma’am ? Because my grocery store doesn’t sell that or any other type of broth . Help ? Rafeena, you can substitute with water and beef bouillon. You can absolutely leave out the beef broth but it won’t be as tasty.